2.New oil can be filled with only when the smoke is light,and it can't be filled over 15ml every time. 2.Disconnect the pipe that needs to be connected with detector. If the pipe needs to be disconnected in the middle. Please secure the other side with a rubber stopple. 4.Connect detector with DC12V battery: red with positive, black with negative. Do not connect in a contrary way. * The detector has protector. If it exceeds working limit, it will power off automatically. In this condition, please operate it later. 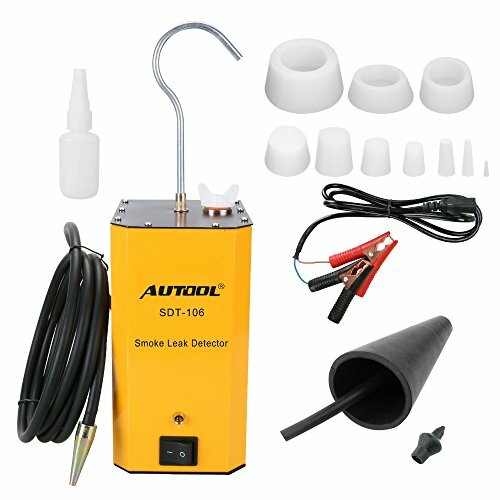 SDT-106 is designed for detecting the leakage of pipe systems on cars, motorcycles, such as fuel pipe, air intake system and cooling tank. SDT-106 is for all pipe systems Support EVAP. Power clip: To connect with vehicle battery. The voltage is DC12V. If you have any questions about this product by AUTOOL, contact us by completing and submitting the form below. If you are looking for a specif part number, please include it with your message.